Get the most from your busy day. 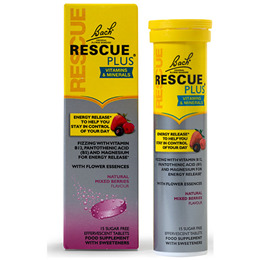 RESCUE PLUS® effervescent tablets have been developed with RESCUE® flower essences and vitamin B12, pantothenic acid (vitamin B5), magnesium and zinc. Bach recognise there are many consequences of a busy lifestyle, from difficulty maintaining normal mental performance to a lack of energy and tiredness. To help combat the consequences of our hectic lives, and for the first time in the brand’s long and successful history, Bach has launched an exciting range called RESCUE PLUS®, combining the unique RESCUE® flower essences with vitamins and minerals. Vitamin B12, pantothenic acid (vitamin B5) and magnesium contribute to the release of energy from food and reduction of tiredness. Zinc supports normal cognitive function. Keep going even on the most hectic days, feeling energised and full of vitality. Acidity regulators (citric acid, sodium bicarbonate), sweeteners (sorbitol, mannitol steviol glycosides), natural flavourings (strawberry, raspberry, blackcurrant), magnesium carbonate, corn starch, elderberry concentrate, zinc citrate, pantothenic acid (as calcium D-pantothenate, B5), vitamin B12 (as cyanocobalamin), flower essences (Helianthemum nummularium, Clematis vitalba,Impatiens glandulifera, Prunus cerasifera, Ornithogalum umbellatum [RESCUE®]). Dissolve one RESCUE PLUS® effervescent tablet per day in a glass of water (100-200ml). Below are reviews of Bach RESCUE PLUS - Berry - 15 Effervescent Tablets by bodykind customers. If you have tried this product we'd love to hear what you think so please leave a review.